390 pages | 125 B/W Illus. Membranes and membrane separation techniques have grown from a simple laboratory tool to an industrial process with considerable technical and commercial impact. The book deals with both the fundamental concepts of preparation, characterization and modification, practical applications along with recent advancements of electro-spun and phase inverted polymeric membranes. 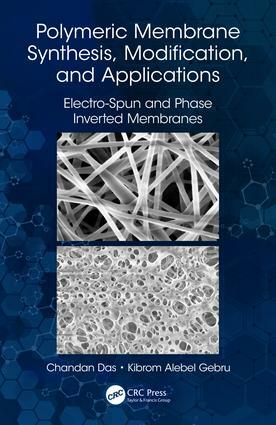 Divided into two parts, part one of this book covers the fundamental concepts and practical applications of novel electro-spun membranes while the latter covers basic concepts and further advancements of the conventional phase inverted membranes extensively. Dr. Chandan Das is an Associate Professor in the Department of Chemical Engineering at Indian Institute of Technology Guwahati (IITG). He has received his PhD in Chemical Engineering from Indian Institute of Technology, Kharagpur (IITKGP) after completing his B. Tech and M. Tech in Chemical Engineering from University of Calcutta. He has guided, so far, 6 scholars for their doctoral degree, 24 M.Tech. and is guiding 8 more doctorate scholars. Dr. Das is the recipient of "Dr. A.V. Rama Rao Foundation's Best Ph.D. Thesis and Research Award in Chemical Engineering/Technology" for the year 2010 from Indian Institute of Chemical Engineers (IIChE). Dr. Das has authored about one hundred technical publications in peer reviewed journals and proceedings. He has authored two books entitled "Treatment of Tannery Effluent by Membrane Separation Technology" in Nova Science Publishers, USA, and "Advanced Ceramic Membranes and Applications" in CRC Press, USA and three book chapters. He has two patents in his credit. He has handled five sponsored projects and five consultancy projects so far. He has visited Denmark, Malaysia, Sri Lanka, Japan and, Greece for exchanging ideas, etc. Being associated with various research works in the area of water and wastewater treatment, such as treatment of tannery wastewater using membrane separation technology, as well as removal of pollutants using micellar-enhanced ultrafiltration, Dr. Das has gained expertise in membrane separation technology for removing various pollutants from contaminated water and wastewater. His research activity encompasses both understanding of fundamental principles during filtration as well as the development of technology based on membrane separation. In particular, his research areas are modeling of microfiltration, ultrafiltration, nanofiltration, reverse osmosis, treatment of oily wastewater, tannery effluent using membrane based processes. He has explored the detailed quantification of flux decline from fundamentals. As an offshoot of the major research, he has fabricated ceramic membranes using low cost precursors as sawdust. Catalyst is coated on the ceramic support for manufacturing catalytic membrane reactor. He is also working on decontamination of chromium laden aqueous effluent using Spirulina platensis. He is actively involved in the productions of high value added products, namely, total phenolics, flavonoids, tocopherol, etc. from black rice as well as of 6-gingerol, vitamin C content, essential oil content from ginger of North East India. Dr. Kibrom Alebel Gebru has received his Bachelor Degree in Chemical Engineering from Bahir Dar University, Ethiopia; Master of Technology in Chemical Engineering from Addis Ababa Institute of Technology, Ethiopia; and Ph.D. in Chemical Engineering from Indian Institute of Technology Guwahati, India. Dr. Kibrom is currently an Assistant Professor in the Department of Chemical Engineering and Acting AdU Director of Consultancy and Business Enterprises at Adigrat University, Adigrat. He has 2 years industrial experience, 2 years University Teaching experience and over 4 years of research experience in the field of membrane science and technology and Environmental engineering. He is an expert in the area of preparation and modification of electro-spun and phase inverted membranes for various applications. He has prepared novel ultrafiltration membranes using electro-spinning and phase inversion membranes for wastewater treatments applications. Dr. Kibrom’s current research interests are in the fabrication of novel membranes using electro-spinning and phase inversion techniques, modification of membranes and membrane based separations for wastewater treatment, biotechnology, biomedical and environmental engineering applications. He has published about seven journals in reputed peer-reviewed international journals like Chemosphere, Journal of Water Process Engineering, Chinese Journal of Chemical Engineering, Journal of Environmental Management, Journal of The Institution of Engineers, Journal of Membrane and Separation Technology, etc.